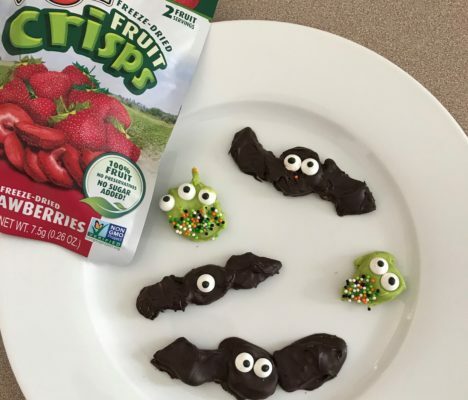 Chocolate Halloween Critters made with chocolate covered fruit crisps! A fun, easy & delicious freeze dried Halloween treat recipe. The perfect family activity for getting into the Halloween spirit! 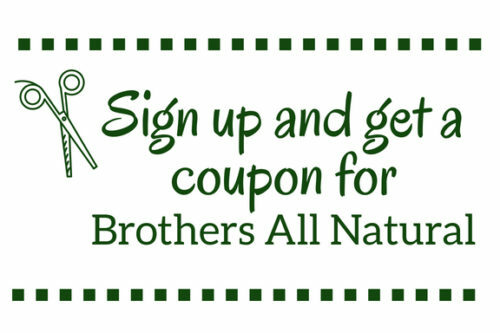 Find the Brothers All Natural freeze dried fruit crisps we used here. Grab a baking sheet, plate or other flat surface and place a sheet of wax paper on top. This is where the fun will take place. Be creative and layout the fruit crisps into different shapes on top of the wax paper. For example, we used apple crisps for bat wings and bananas for a bat body. Next, place the melting chocolate into a microwave safe bowl and melt for about 15-20 seconds, then stir. Repeat until the chocolate is almost all melted and stir until any leftover chocolate chunks disappear. **We used a 1/2 cup of melting chocolate. Add more or less depending on your preference. Use your hands or a fork and dip the fruit crisps into the chocolate until covered. Place back onto the wax paper. If you need to attach any pieces together just use a dab of chocolate after the other pieces are coated and dried (we did this to make sure the bat wings stayed attached to the bat body). The last step is to attach the sprinkle eyes. Place them on the chocolate before it dries or use more chocolate to attach them. Repeat these steps until you've made a bunch of cute & creepy critters! Let your creations air dry for 20-30 minutes or place in the fridge/freezer for 20 minutes. Gently peel them off the wax paper. Enjoy!